Our laboratory is conducting innovative multidisciplinary research to understand organization and function of synapses in central nervous system and those between motor neurons and skeletal muscles. 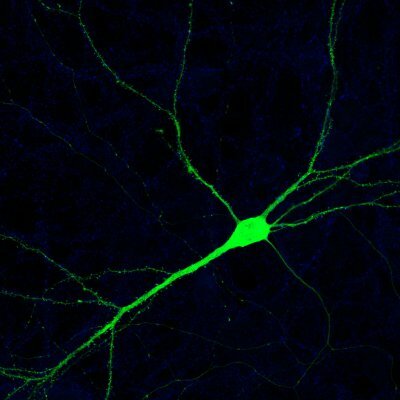 In our work we use predominantly mouse models including conditional knockout and transgenic mice as well as cultured cells to decipher molecular machinery that orchestrate synapses in the physiology and disease. 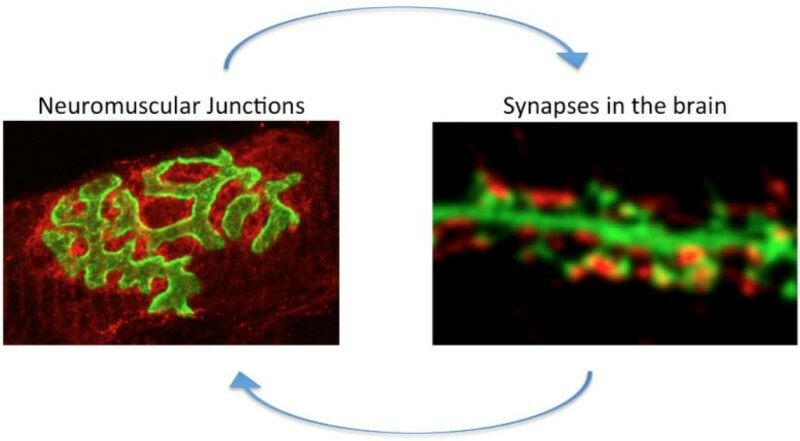 Neuromuscular junctions (NMJs) are specialized synapses formed between motor neurons and skeletal muscle fibers. These structures are responsible for transmission of information from the central nervous system to skeletal muscles allowing for their contraction. Proper functioning of NMJs is crucial for our voluntary movements, maintenance of the body posture and breathing. Therefore, malfunctioning of NMJs leads to serious neuromuscular disorders characterized by muscle wastage, los of strength and respiratory problems. It is estimated that there is over 300 neuromuscular disorders and 50% of them are of unknown etiology. Thus it is important to understand the mechanisms underlying the organization and functioning of these synapses. NMJs of many vertebrates have complex topological organization, which is predominantly characterized in rodents. Because of its branched appearance these structures are often called pretzels. Interestingly, "pretzels" are formed during postnatal remodeling of juvenile synapses, that at birth have simple, plaque-like appearance. With time, synaptic contacts grow bigger and become perforated with scattered openings that at later stages become more numerous and fuse together to form cracks and indentations between AChR-rich branches of the postsynaptic machinery. Thus the perforations formed in the juvenile synapses seam to drive the remodeling of the synapses from "plaque" to "pretzels". It is interesting that aberrations in the "pretzel" formation are associated with many neuromuscular disorders. Despite the link to pathology, the molecular machinery responsible for developmental remodeling of the postsynaptic machinery is widely unknown. Identification and characterization of key players regulating NMJs remodeling is in the center of interest of our laboratory. Indivudual muscle fibers are shown in red (contractile machinery ) The approaching motor neuron is shown in blue and it's terminal part is overlaying muscle postsynaptic machinery shown in green (AChRs). It is well known that the nerve terminal and nerve derived factors like glycoprotein agrin and neurotransmitter acetylcholine, play a crucial role in the organization of the postsynaptic machinery. Therefore, the presynaptic nerve has a dominant role in the organization of the neuromuscular synapse. However, some observations suggest, that muscle cells could have intrinsic program for the remodeling of the postsynaptic machinery, which could contribute to the nerve-based mechanisms for synaptic remodeling. 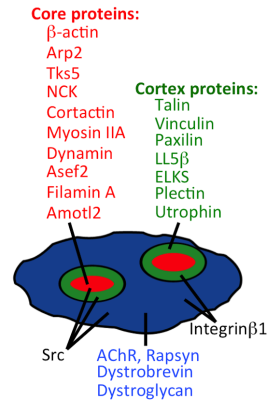 For instance, muscle cells cultured on laminin-coated surfaces in the absence of neurons form complex assemblies of postsynaptic machineries that are remarkably similar to the postsynaptic specialization at the NMJ in vivo. The similarity includes size and shape of the assembly, similar molecular machinery and the requirement for the same crucial molecules. 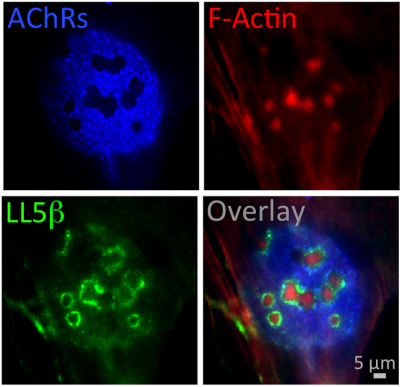 Moreover, clusters of the AChR in laminin-cultured cells undergo similar stages in the developmental remodeling as postsynaptic machinery in vivo. We have recently made unexpected discovery that the perforations in AChR clusters in cultured muscle cells are made by specialized organelles called podosomes. Podosomes are actin-rich dynamic adhesive organelles that degrade extracellular matrix, which at the NMJ is needed to stabilize synaptic machinery. Podosomes were reported in many cell types and especially in cancer cells where they promote invasive behavior and tumor metastasis. It is estimated that couple of hundreds genes are involved in the organization of podosomes. Their components are typically segregated into two distinct domains - centrally located core containing actin and actin-organizing proteins and peripheral cortex that contains many focal adhesion proteins. Based on our observations, we proposed a model how dynamic podosomes could contribute to the remodeling of the muscle postsynaptic machinery in vitro. These organelles appear underneath AChR clusters and form perforations in the assemblies, later on due to their mobility, they contribute tot he formation of the topologically complex structures. Current project in our lab aims in visualization and characterization of the ​similar molecular machinery in vivo. 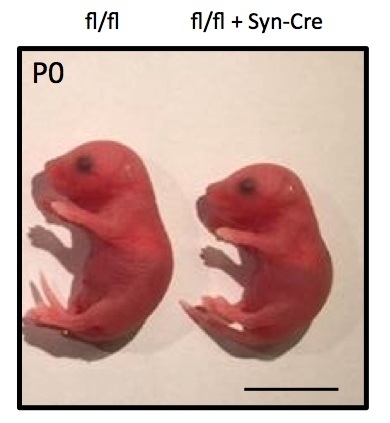 ​On of our favorite proteins on which we work is Amotl2 (Prószyński et al., Journal of Cell Science 2013) . Other projects are focused on characterization of novel components of the Dystrophin-associated Glycoprotein Complex (DGC). This protein complex plays a pivotal role in the maintenance of muscle fiber integrity as well as in the organization and development of the postsynaptic machinery. 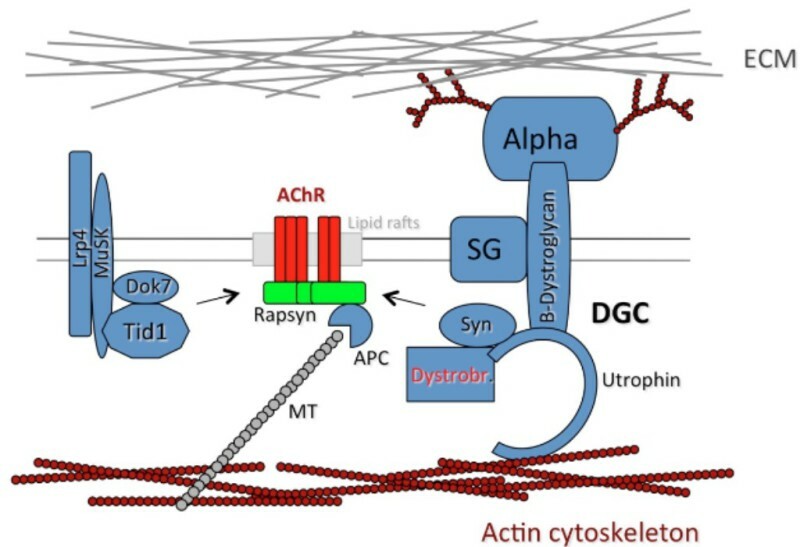 On the molecular level, DGC helps to stabilize synaptic components by linking it to the actin cytoskeleton and extracellular matrix and also serves as a hub for assembly of signaling molecules. We have recently identified novel synaptic proteins that are recruited to the cytoplasmic component of the DGC, a protein called alpha-dystrobrevin-1 (Gingras et al., Journal of Cell Science 2016) and now we perform more detailed studies on some of them. Many proteins that play a role in the organization of NMJ in general and remodeling of the postsynaptic machinery in particular, are also involve in orchestrating synapses in the central nervous system. Therefore, some of our projects are extension of studies on NMJ to synapses in the brain. Synapses in the brain are about 100 times smaller than the NMJ and they are less accessible for manipulations. Therefore some aspects of synaptic machinery functioning could be easier to study in the peripheral nervous system. However, we believe that in the long run, studies on each experimental system could contribute to each other. Studies on CNS synapses are conducted in our laboratory both on cultured neurons as well as on brain slices. 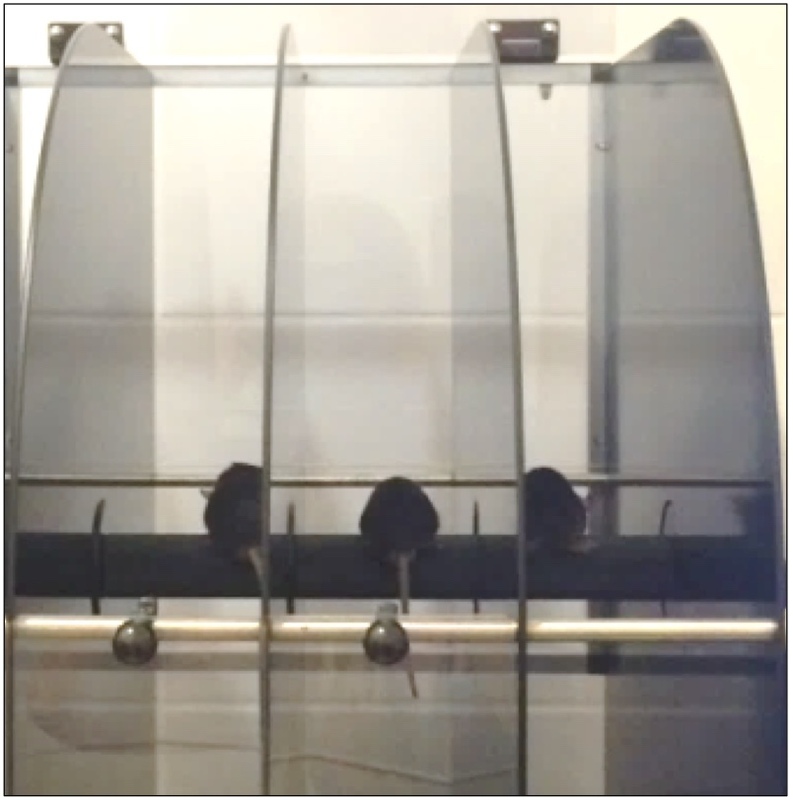 Finally, we have developed several conditional knockout mice that will us to investigate functions of genes of interest on the behavior of live animals including their ability to learn and cope with stress. Domain organization of synaptic components. Pęziński M and Prószyński TJ. The molecular cross-talk of the dystrophin-glycoprotein complex" in its current form for publication. Gawor M and Prószyński TJ. Annals of the New York Academy of Sciences 2018 Jan;1412(1):62-72. 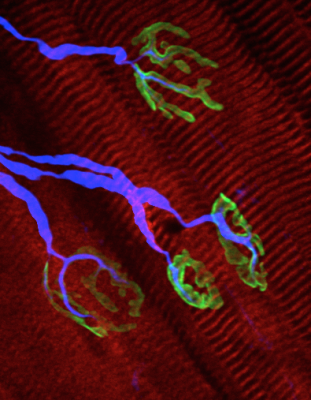 Liprin-α-1 is a novel component of the murine neuromuscular junction and is involved in the organization of the postsynaptic machinery. Bernadzki KM, Gawor M, Pęziński M, Mazurek P, Niewiadomski P, Rędowicz MJ, Prószyński TJ. Sci Rep. 2017 Aug 22;7(1):9116. doi: 10.1038/s41598-017-09590-7. Waschek JA, Cohen JR, Chi GC, Proszynski TJ, Niewiadomski P.
Gingras J, Gawor M, Bernadzki KM, Grady RM, Hallock P, Glass DJ, Sanes JR, Proszynski TJ. J Cell Sci. 2016 Mar 1;129(5):898-911. Bernadzki KM, Rojek KO, Prószyński TJ. Eur J Cell Biol. 2014 Oct;93(10-12):478-85. J Cell Sci. 2013 May 15;126(Pt 10):2225-35. Oh HJ, Abraham LS, van Hengel J, Stove C, Proszynski TJ, Gevaert K, DiMario JX, Sanes JR, van Roy F, Kim H.
J Biol Chem. 2012 Jun 22;287(26):21717-28. Proszynski TJ, Gingras J, Valdez G, Krzewski K, Sanes JR.
Proc Natl Acad Sci U S A. 2009 Oct 27;106(43):18373-8. Klemm RW, Ejsing CS, Surma MA, Kaiser HJ, Gerl MJ, Sampaio JL, de Robillard Q, Ferguson C, Proszynski TJ, Shevchenko A, Simons K.
J Cell Biol. 2009 May 18;185(4):601-12. Proszynski TJ, Klemm R, Bagnat M, Gaus K, Simons K.
J Cell Biol. 2006 Jun 19;173(6):861-6. Proszynski TJ, Klemm RW, Gravert M, Hsu PP, Gloor Y, Wagner J, Kozak K, Grabner H, Walzer K, Bagnat M, Simons K, Walch-Solimena C.
Proc Natl Acad Sci U S A. 2005 Dec 13;102(50):17981-6. Proszynski TJ, Simons K, Bagnat M.
Mol Biol Cell. 2004 Apr;15(4):1533-43.